I stopped using fluoridated toothpaste YEARS ago. Fluoride, after all, is the reason why toothpaste is required to have a poison label on it. That's a topic for another day; meanwhile, I want to get a couple of primary points down on tooth care and point you to my favorite solution (and a couple others in case you prefer them). Fluoride isn't the only problem in toothpaste. Your big brand toothpastes use loads of chemicals that no one would want to consume if they knew what they were doing. In my opinion, it's better to brush with water and then freshen your breath with the right kind of mouth wash like this one ... or simply brush with that mouth wash, since they actually call it a brushing rinse. Sodium laurel sulfate and titanium dioxide are common toothpaste chemicals that come to mind, along with artificial colors and flavors that are based on petroleum and are banned in some countries. But even your "all natural" toothpastes have one innocent looking ingredient that I think is a real killer to your teeth: glycerin. It is very challenging to find toothpaste without glycerin. And why not -- that's what gives your teeth that oh-so-smooth feeling. Exactly what you want, right? No! The problem with that coating is that it prevents your teeth from healing! You see, your teeth are supposed to REMINERALIZE (actually REBUILD themselves) from the minerals in your saliva. But the coating from glycerin keeps this from happening. So one of the best things you can do for your teeth is to use toothpaste without glycerin. Tooth Soap is actually one excellent choice, but we found that it just didn't "do it" for us. The "shreds" (click the link to see) kind of made us gag. The drops were fine, but weren't as nice an experience as we had with other options. (They have new options that I haven't tried and that look pretty good.) And it's pretty expensive. Still, if you like it, it's a very good choice. Ingredients in the basic formula: organic extra virgin olive oil; organic coconut oil; spring water; essential oil. That's it. Bee Rescued is another choice I really liked. This is a propolis toothpaste (really more of a gel), so it can't be used by those with allergies to bee products. It has a mild taste of honey and, as with Tooth Soap, easy ingredients to read and understand: purified water; baking soda; xanthan gum; propolis extract; grapefruit oil; clove oil; tea tree oil. My favorite option today, however, is EarthPaste. With several flavors to choose from (flavors come from essential oils), it tastes great and is sweetened with xylitol, known to help strengthen teeth. As with the other two I've recommended, no poison warnings -- it's totally safe if swallowed. 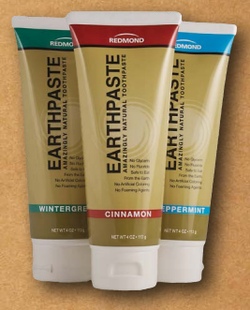 Purified Water, Redmond Clay, Xylitol (non-GMO), Essential Oil (Cinnamon, Wintergreen or Peppermint) (wild crafted), Real Salt, Tea Tree Essential Oil, Menthol (Only in the Wintergreen & Peppermint varieties) (only natural menthol produced without chemicals). The clay is really important, because it not only helps to clean the teeth, but it is also packed with minerals that help to rebuild your teeth on the spot. Since so many of us are DEPLETED when it comes to minerals, this is a key reason for my excitement in this product. The salt also includes many minerals, and has its own anti-bacterial properties. And of course essential oils have their own benefits. Pet lover? Some people also use Earthpaste with their pets, but because of the xylitol (which they explain dogs and ferrets cannot digest), they recommend that you use wintergreen for pets, as this is their one flavor without xylitol. ​I really hope you'll give EarthPaste (or one of the options) a try. Almost anyone in the natural health community (if they have some experience) know how much our overall health is impacted by the health of our teeth, and this is a very simple way to make a big difference in your life.